Liverpool took a firm grip on their Champions League quarter-final as Manchester City were torn apart by a three-goal burst from Jurgen Klopp's side in the first 31 minutes at Anfield. City's only Premier League defeat as they move to the brink of the title has been a 4-3 loss at Anfield in January - and they were made to suffer once more in the face of Liverpool's pressing, aggression and potent attack. 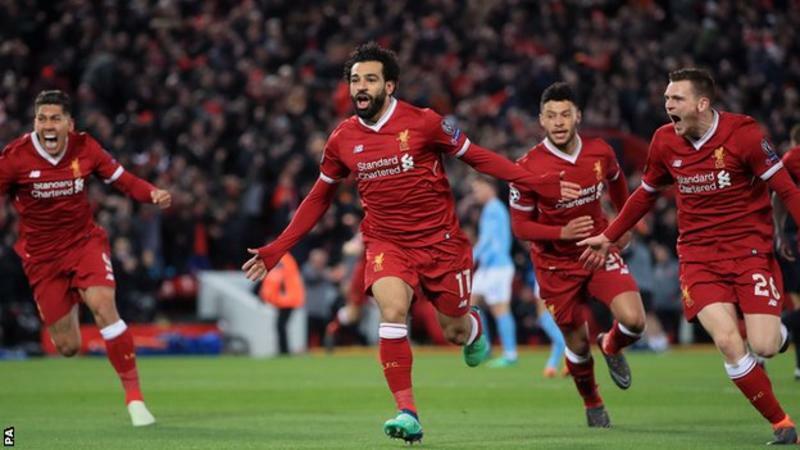 Mohamed Salah pounced in the area to score his 38th goal of the season after 12 minutes and Alex Oxlade-Chamberlain doubled their lead eight minutes later when he unleashed a fierce shot past Ederson from 20 yards. And the third goal that gives Liverpool such a commanding advantage to take to Etihad Stadium next Tuesday came just after the half-hour when Sadio Mane rose to head home Salah's cross. Liverpool, potentially crucially, emerged from the second half without conceding an away goal, although an injury that forced Salah off will be a concern. Anfield was at its most hostile - but there were unsavoury incidents before kick-off when fans outside the ground attacked and damaged the Manchester City team coach on its way into the stadium, prompting an "unreserved" apology from Liverpool and an investigation from Merseyside Police.